Let's Do It for ME! : Let's Move the Goalposts for ME! 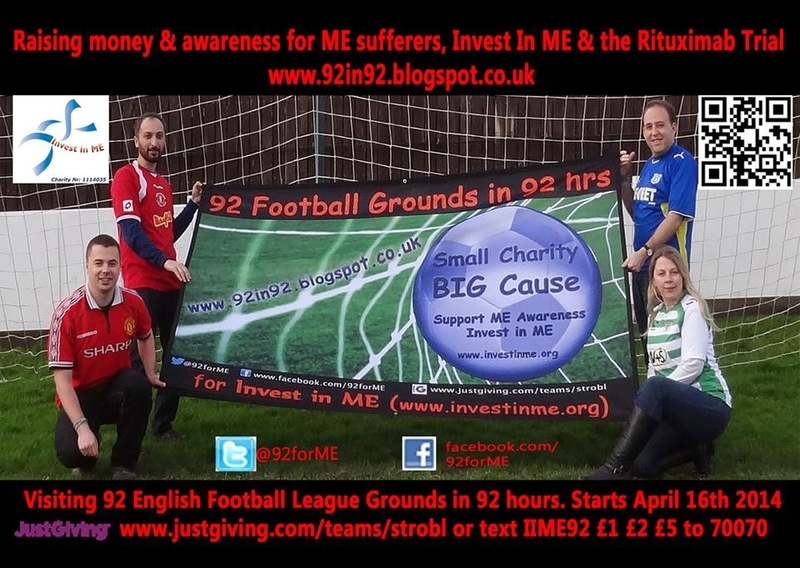 APRIL UPDATE: This whistle-stop tour of 92 football league grounds in 92 hours by four friends of M.E. sufferer Ian to raise awareness and funds for a ground-breaking medical treatment trial runs from 16th to 21st April. Big THANKS to all who are helping to get maximum coverage and support from football clubs and media across the country for this incredible challenge by the fan-tastic foursome - Team 92 for ME! To donate to Cat, Mike H, Mike W or Raza on JustGiving or text IIME92 £1 (or £2, £3, £4, £5, £10) to 70070. You can also follow them on Twitter @92forME or find them on Facebook or see their blog. The tour kicked off in the West Country with this great piece by regional ITV News. Team leader Mike Harley was also featured with a chat on BBC Radio 5 Live (fwd to1 hr 46 mins). To make it easier, we drafted a letter you can use to contact your local newspaper, local news website, local TV stations, radio and football clubs (see below). You could also post on media and football club Facebook pages or tweet them the link to the event website (link below). This is a great opportunity to raise public awareness of myalgic encephalomyelitis (ME) and biomedical research into this disease. If you get a positive response or hear of local media coverage, please tell us or Team 92 for ME so that they can add the info and links to their website. Graphic created by Ian showing all the fantastic clubs supporting the event so far. List of club responses so far. List of media responses so far. Here's a letter you can use to contact media and clubs. 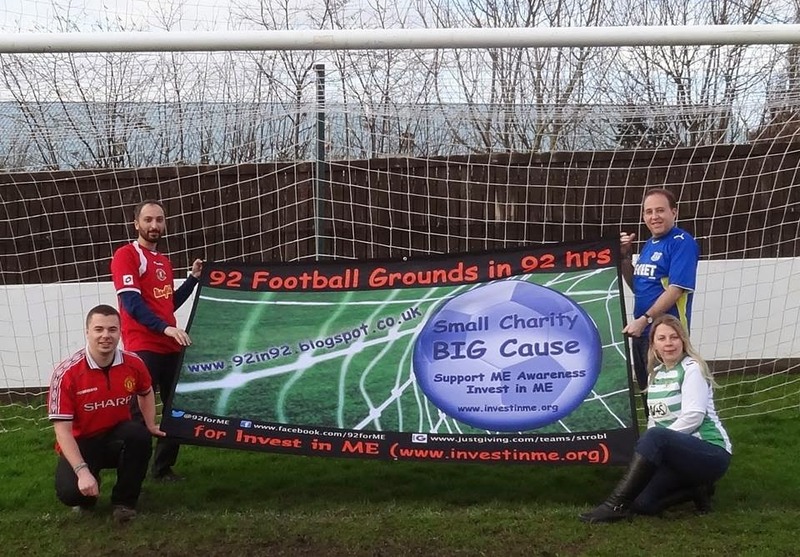 A team of football fans from Bristol are aiming to visit all 92 English football league grounds in 92 travelling hours in support of Invest In ME (www.investinme.org) - a leading M.E. research charity in April this year. The team start their challenge on Weds 16th of April and are aiming to raise awareness for myalgic encephalomyelitis - an illness which they feel does not get the funding/research as many others. Their childhood friend, Ian, has been off work with the illness for over 7 years and now Invest in ME are raising funds for a ground-breaking new research trial that could help him and up to 250,000 other UK sufferers get back to living normal lives. Team leader Mike Harley told us: "The idea is to reach the grounds at a time where we can give out information and maximise on raising the profile of M.E, the need for research into the illness and the Invest in ME charity. It's going to be a gruelling challenge but one as football fans we're all looking forward to!" They are set to appear on ITV News, BBC Radio and Talksport and are hoping to raise the profile as much as possible. They will be starting the event in Plymouth and finishing up at Middlesbrough on Monday 21st of April having completed the 2700 mile challenge. Over 50 clubs across all 4 divisions are helping to publicise their event and you can find more info on their challenge through their website and sponsorship page below. It would be brilliant and much appreciated if you could help raise public awareness of this charity challenge. Thanks in anticipation. The ball's in our court - let's do it for ME!